These muffins are fantastic. I doubled the original recipe (because 9 muffins that the original made is way too few), and then as Mom and I helped ourselves to a second, and Dad said he liked them. We decided we needed to make more. So I made another batch, this time tripling the original so that we’d have enough to take over to my aunt. So to say I like them might be an understatement. For the second batch I made them into mini muffins (with a triple of the original recipe this gave me 48 minis and 12 regular). Do you remember those packages of mini muffins that are portioned out into little bags for easy packing in lunches? I used to get those on occasion, and these mini muffins reminded me of those, except way healthier AND more delicious. 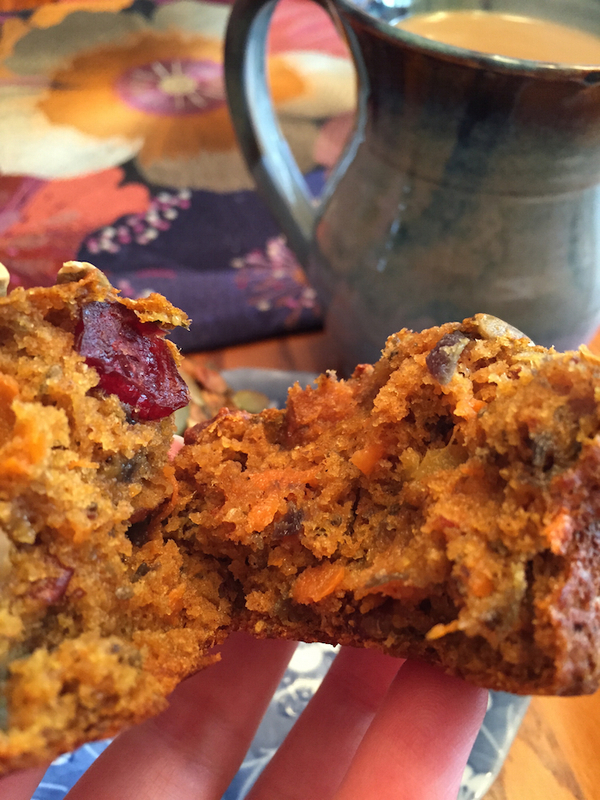 These muffins have pumpkin and carrot which keep them moist and tender and add a little vegetable to your day. 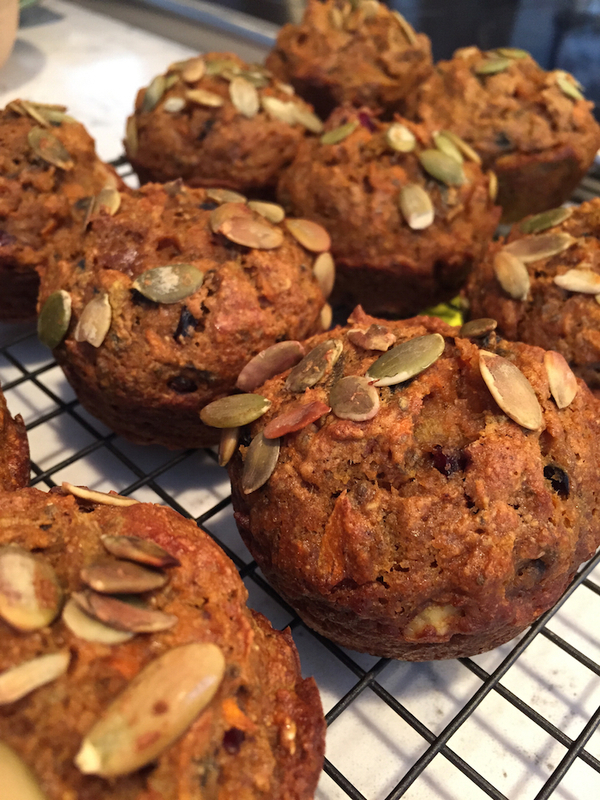 They’re made with half whole wheat flour which ups their fiber, and I added a dash of chia seeds which add some omega-3s (if you don’t have chia seeds you can leave them out or add in some flaxseeds). Pecans and pepitas add some protein and some crunch. These are delightfully flavor-packed muffins. They’re definitely a new favorite and don’t taste overwhelmingly like fall, more like carrot cake. Preheat oven to 375°F. Grease muffin tins with cooking spray and set aside. In a large bowl, mix together the pumpkin, brown sugar, oil, vanilla, and eggs. Sift in the dry ingredients and mix until just combined. Fold in the carrots, pecans, and craisins. Scoop the batter into the prepared muffin tins, then top with a sprinkle of pepita. Bake for 20-22 minutes, or until a toothpick inserted in the center comes out clean. Remove from pan and let cool on a wire rack.